The magnificent Baroque Erhardkirche church would be considered as being outstanding anywhere else - but since it is in Salzburg, visitors often miss it. Which is a pity, since the Erhard Church is an architectural gem just in a very central location: at the Nonntaler Hauptstraße, just south of the Fortress hill under the Nonnberg Nunnery. 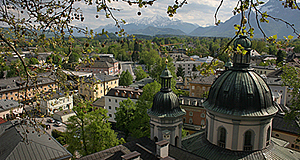 The Erhard Church is the Parish church of the Nonntal district and alongside with the Kajetanerchurch the second sacral building in Salzburg by Giovanni Gaspare Zuccalli. There was a chapel on this site since the 13th century. In 1310, a "Siechhaus" was built, a mix of a hospice and a hospital for people with plaque and leper. In the early 17th century, during the reign of Prince Archbishop Wolf Dietrich von Raitenau, the building served as a hospital for the employees of the Salzburger Dom cathedral. Prince Archbishop Max Gandolf eventually ordered the construction of today′s Erhardkirche between 1685 and 1689. The Erhard Church has a slightly lifted main gate with a double-sided staircase, which was necessary because the Nonntal district used to be flooded frequently. A pillar hall or peristilium is attached to the central hall with its massive dome. The towers have octagonal bell floors. The dome is richly decorated with stucco work in terracotta, mostly by Francesco and Carlo Antonio Brenno as well as Ottavio Mosto. The round paintings in the dome depict scenes from the life of St. Erhard. The main altar has twisted pillars and was built by Andreas Götzinger in 1692. The altar painting was made in the same year by Johann Michael Rottmayr and depicts St. Erhard baptising Ottilie. The altar paintings of the side altars are most likely by Frans de Neve. The church is a good starting point for some walking around the Hellbrunnerallee area.